There are lots of things that you can take with you when you leave your camp and head out to enjoy the Burn, from the useful to the entertaining to the down-right bizarre, however I am looking at only the most essential: the three items that you should have with you whenever you’re away from your stuff. These are water, a cup, and a plastic packet. I explain why below. Dehydration is a fast way to stop enjoying your experience, and is easily avoidable. Always take water with you, especially if you are going out partying. You won’t want to have to return to your camp every hour for a drink, and you can’t always rely on the kindness of strangers, and you don’t want to ruin your party. So, clip a bottle on your belt, or put it in a pack on your back, but take it with you. Carry a cup. When people hand out free drinks, they often don’t hand out free cups. 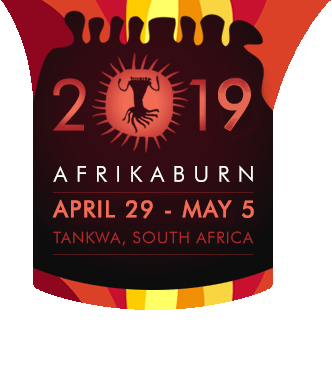 Remember that AfrikaBurn is a Leave No Trace event, which means that handing out cups makes for rubbish that you (or they if they’re kind) have to pack away and take home. Besides the trash factor, it’s more environmentally friendly. Even better, you know where your cup has been. Put a plastic packet in your pocket. This is especially true when you take a can (or more) of beer out on your wanderings, or if you’re given one while on the road. Crushed cans are compact, but they have a horrible tendency to leak when you put them in your pocket. This is where the bag comes in. If you smoke, the bag is a good place to put your cigarette butts, though a sealable container is better. The bag is equally useful for other random trash that you have to deal with. Leaving No Trace is a communal responsibility. If you see trash, pick it up – it’s not other people’s trash, it’s our trash. Politely educate other burners that don’t seem to understand this principle. Consider taking a spare bag to pass on to a less prepared beer drinker. Some items that didn’t make the top three, but are very useful: toilet paper, it’s good for more than just toilets; hand sanitizer, after the loo, before you eat, it helps to kill germs; a knife or multitool, it makes you look super prepared when someone (possibly you) needs one; and pen and paper, for stuff you need to remember, such as (say) an address or phone number. If you don’t have pockets or a backpack, not to worry. Clipping a cup and a bottle of water to your belt makes a truly burner fashion statement, and you can tie your bag to the same belt. If you don’t like belts, get creative: you can wear a sash or a sling or a bandolier. However you carry them, take water, a cup and a bag on your next wander. Previous Post: Sleep in the Belly of a Beast!